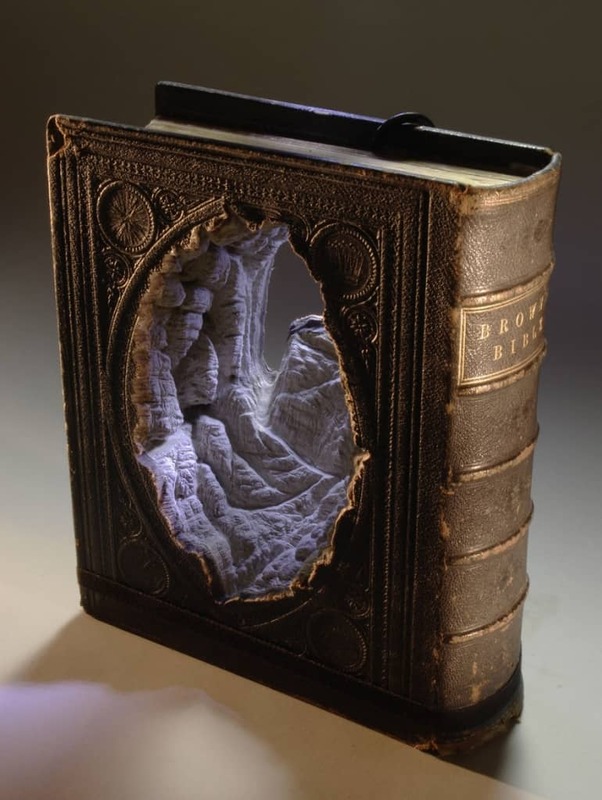 Now, generally I don’t condone the destruction of a book in any way, shape, or form, but these following sculptures created solely from the pages and bindings of books are beyond incredible. It is fascinating to think there are people out there with enough imagination and skill to achieve things of this magnitude, and then have the decency to share it with the rest of us who could never accomplish something quite similar without utterly destroying our favorite novels to an irreversible nature. There is a fine mixture of wonder and amazement at these book sculptures, so it won’t be hard to find a favorite amongst the group. Whenever we pick up a book we tend to utilize the creativity and imagination within our mind to the best of our ability. The right book, with the right words, can ensure we create an entire world, complete with all of the characters described within, right in our minds. 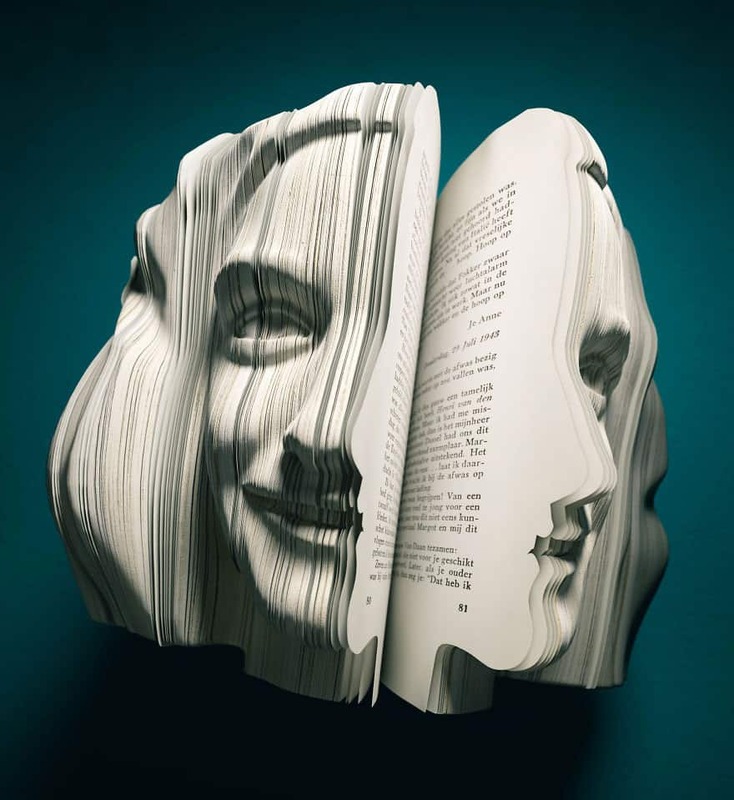 But, this artist took things a step further by creating the entire face of someone directly into the pages of the novel he may, or may not have, finished. It doesn’t look like there are enough pages or room for an entire face to be sculpted into the book, but apparently that isn’t so. Take a look at the contours of the face, the little detail that went into the mouth, nose, and eyes on the woman. You’d be hard pressed to find something better in a block of marble. Make sure to turn the book sculpture away at night, though, for fear of something ancient and evil escaping into the room. Origami has ensured mankind can twist and conform paper to suit our stylish needs, everything from a swan to a flower can be made using nothing but paper. 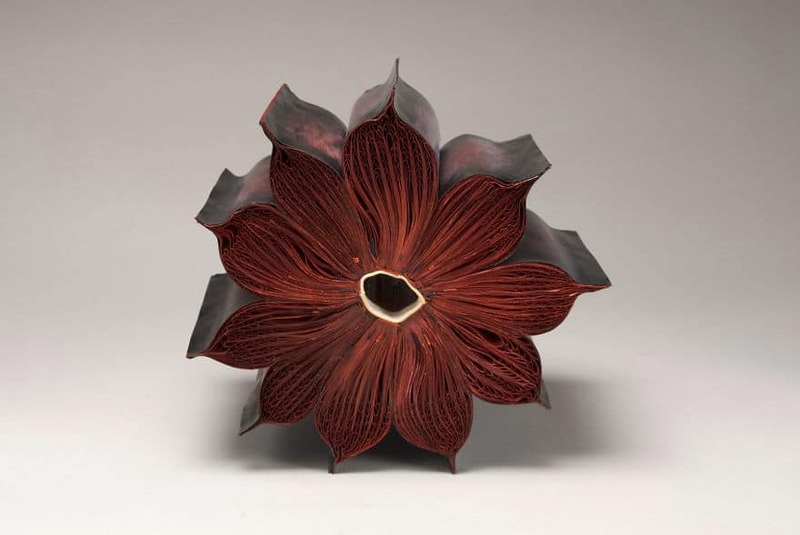 Well, this artist decided to take things a step further by taking an entire book and forming an entire flower from the pages within. The binding of the novel acts as a center piece, holding the paper petals together in one flawless form. The coloring of the pages is beyond interesting, it leads onlookers to believe some added work was put in after the sculpting took place, which may be the case. Even if the artist did color the book afterwards, does it really matter? This piece is beautiful, and would be a wonder to look upon within any home throughout the day. You don’t even have to worry about it tipping over, as the two bottom paper petals seem to hold the entire sculpture up without a problem. The ability to take simple paper and turn it into something more is always a wonderful sight to behold, but when you create an entire landscape in an old book, then you’re really at a masterful level when it comes to sculpting a book. These two pieces exemplify the amount of skill, patience, and time it takes to obtain the perfect landscape. The first is a little more simple, offering a look at the top of a mountain, complete with stepping stones and a small tree embedded into the rock. 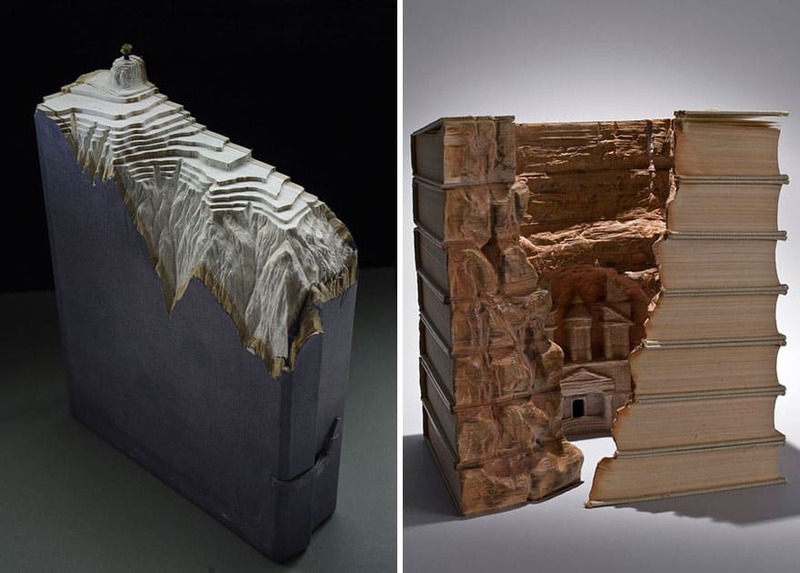 However, the second piece is where most of the wonder comes in, as the artist managed to recreate Petra, Jordan, or so it appears, within the interior of a group of books combined into one. The exterior of the tomes provide a mountainous landscape to holster the interior, where the temple rests comfortably embedded into the paper rock. There is always something eerie about a skull, particularly one that appears to be grinning to those who look upon it, though that tends to be most of them thanks to the row of teeth adorning the front of the face. 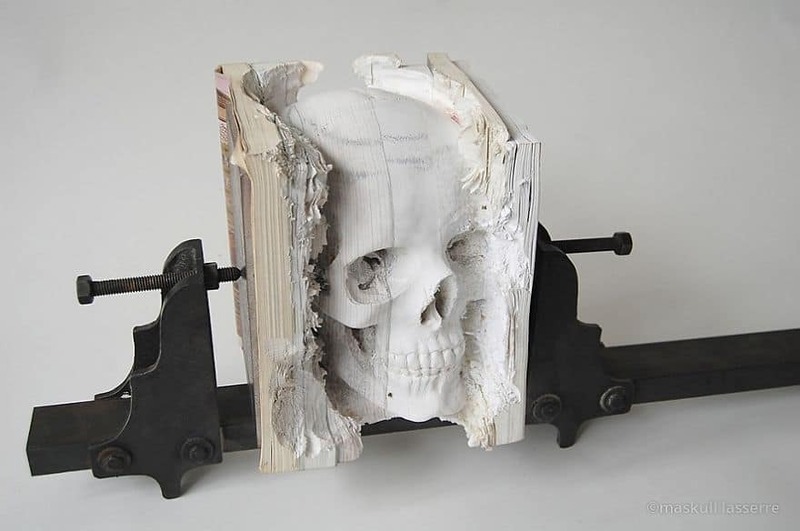 However, creating an entire skull from the interior pages of a novel is something that not even the creepiest of visages can prevent someone from feeling the wonder and awe. The pages of a book tend to be leaf-like, splitting apart as if they weren’t connected in any way, not even by a binding at the back of the book. So, this artist had to do some hard work to ensure everything stuck together enough to carve out the head, interior of the eye sockets, the caverns in the nose, and the chiseled teeth at the bottom of the face. We commend his expertise, but don’t want this one on our shelves at night. The hardcover binding of a book is generally pretty tough, as you can drop it, keep it in a drawer for a lengthy period of time, and even spill some things on it (though we suggest not doing so) without fear of ruining the leather-bound edition in your hand. Combine that tough exterior with a paper interior and you have the perfect set up to create an entire network of caverns within the pages. This particular artist managed to capture every nook and cranny of the cavern, including a pathway leading deeper into the depths of the rocky caves. The coloring of the pages appears a little off, making it appear even more rock-like than the simple white of a novel’s interior. Working with such tiny detail has to be draining on the eyes, but the hard work pays off in the long run with a masterpiece like this. The holiday season is coming to an end, but that doesn’t mean the joy of a snowy night, the glow of street lamps, or walking down a cobbled road can’t be an ever lasting feeling for many of us. This artist wanted to capture that feeling of a quiet night under the stars, the moon shining bright, and snow falling from the sky in a steady rhythm. It’s impressive to think this entire scene came from a single book, including the little snowflakes, the trees, and the soft flow of chimney smoke. The lights are particularly interesting, as it makes the entire scene appear to be completely realistic. Set against the black background, one may think this was created from another material entirely, but the words on the pages give it away. 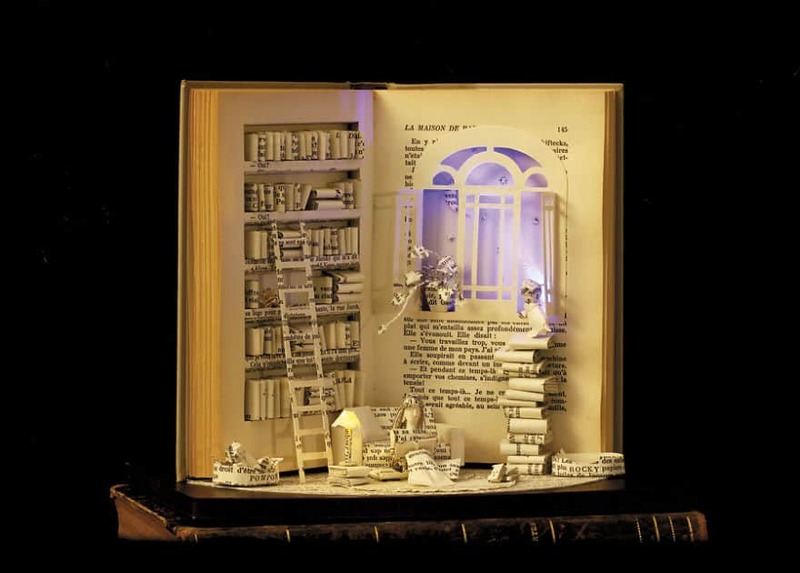 If ever there was a book sculpture to purchase, this is the one we’d choose. 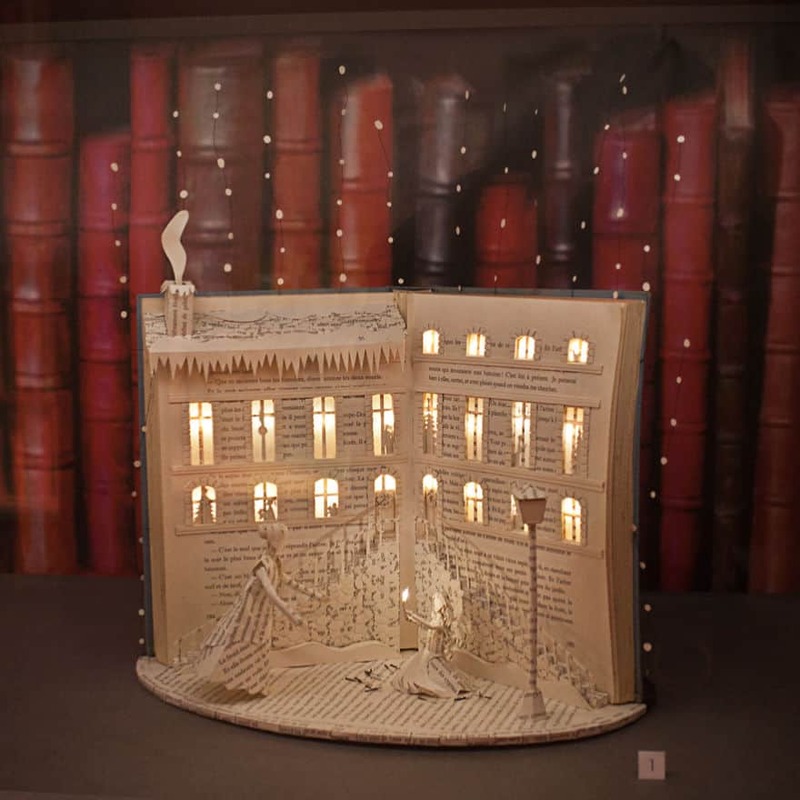 It’s hard to argue against all of these book sculptures being impressive, as they all truly are. However, to build an entire city out of nothing but the pages of a book, or numerous books, as it appears with this particular sculpture, is so completely out there it’s almost hard to believe it was possible. 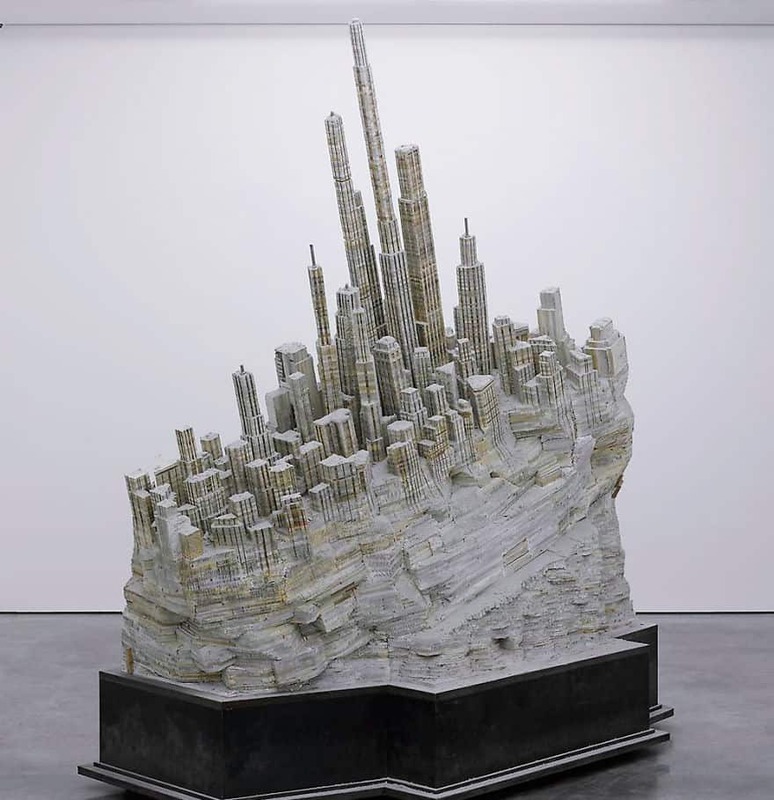 Thankfully, the proof is right in front of our eyes, as this artist managed to recreate the entirety of a fictional city atop a rocky outcropping from nothing but novels. We can’t even imagine how long this one took to complete, as it appears quite massive, even requiring its own platform to be held aloft for people to view. The only worry here may be whether it could tip over from the weight of all those books piled high above the ground. It’s definitely one to behold, but it probably won’t fit in most people’s homes. Getting the coloring right in a sculpture has to be one of the most difficult parts of the process, besides the cutting and shaping, as the artist has to ensure she (or he) gets it correct the first time through, otherwise the entire piece could be ruined if it doesn’t flow well together. Now, with that thought in mind, take into account the hundreds of butterflies flowing forth from the pages of this particular novel, which, after the butterflies were complete, only has a few pages left stitched together in the leather binding of the novel. Combing all of these beautiful creatures together to ensure it flows smoothly upward has to be a difficult task, but we’re sure glad this particular artist managed to capture every little detail and color to make this piece. 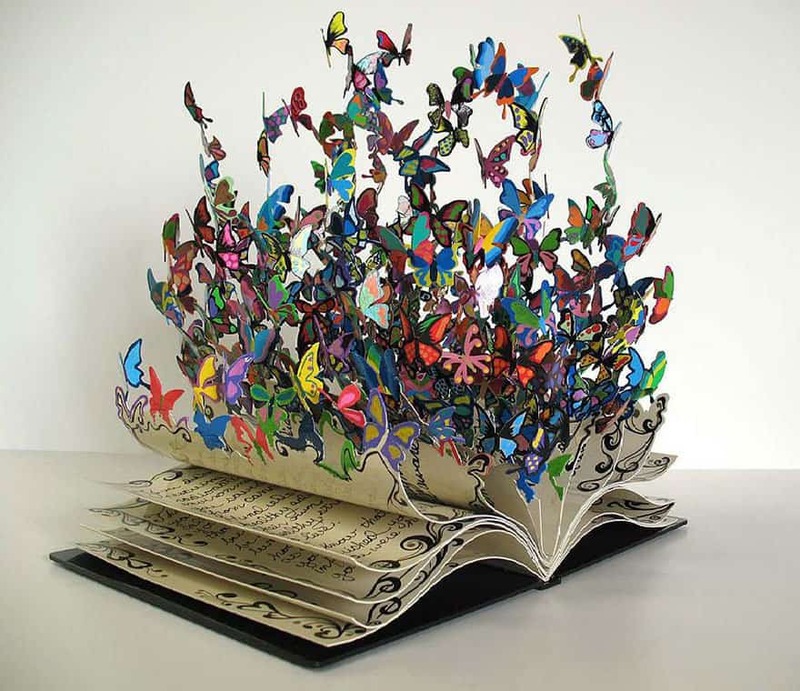 It would be interesting to see whether the pieces moved, allowing the butterflies to softly flutter along with the pages. Bugs are generally pretty creepy things to behold, as they crawl into the tiniest of places, and if you don’t keep your eyes on them then they disappear for good, ensuring you never sleep again in the same room as the sighting. However, bugs, made of paper, that come crawling forth from a favored novel or journal are interesting enough to behold without feeling too gross for eyeing them up and down. These bugs, as created by the artist, are incredibly detailed, though it certainly took some work to ensure they all came out perfectly. 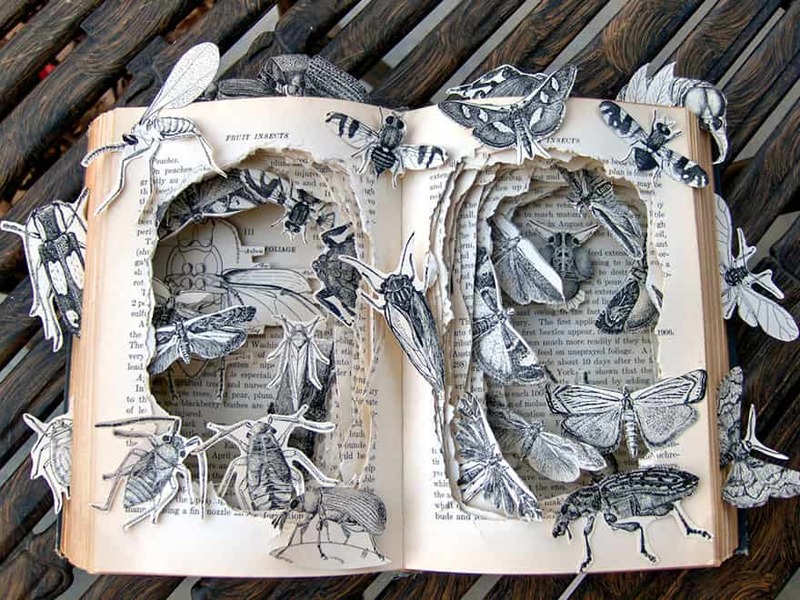 Thankfully, the individual who sculpted this particular piece used a bug book, allowing them to cut the imagery of each insect from the pages to allow them to come to life and spread out into the world on their own. It might be a little creepy still, but it’s far more interesting than a real insect on your desk. 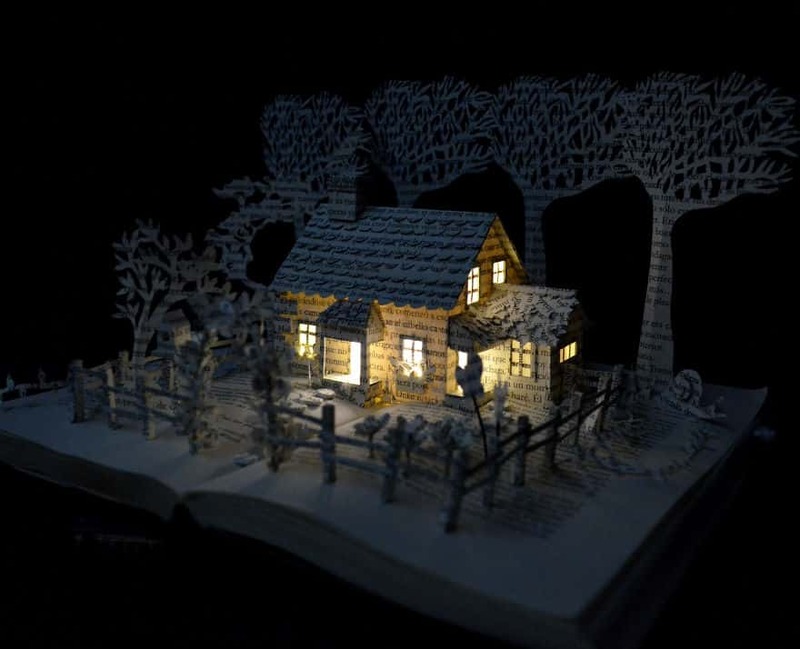 Once again, there is another artist out there with the ability to create an entire home, lights and all, from the confines of a popular book and its pages. If that weren’t enough, this artist went above and beyond to ensure the makeshift home had trees interspersed in the background, a picket fence surrounding the domain, a snail, and even a birdhouse at the front of home as a welcome sight to the woodland animals surely within the same world as this country house. The level of care and attention is admirable, and is certainly interesting enough to warrant a purchase, should a piece of artwork like this ever be sold. We certainly wouldn’t mind featuring this one prominently within our homes for all to see as they enter our domain. Of course, we’d also be worried about knocking it over and forming an earthquake for those living within the abode. 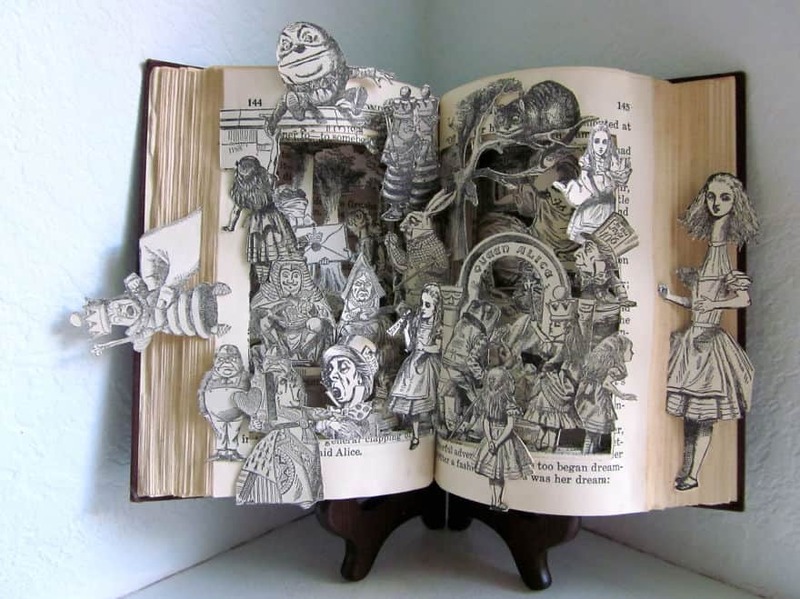 If ever there was a classic novel that required a recreation in the form of a book sculpture, it was Alice in Wonderland. The tale of a young girl exploring an entirely new world to what her senses are used to, full of magic, wonder, and incredible creatures, makes for the perfect landscape to come to life from the pages of a book. Each character from within the book is recreated using the pages of this particular novel, with some drawing to accompany the work, ensuring everyone knows exactly what they’re looking at. We’re particularly fond of the Mad Hatter at the center of the piece, mouth wide open. Of course, everyone has their own favorite character from the book, and that character is surely featured within this sculpture at some point or another. The depth is also notable, as the work goes into the pages deep, allowing a bit of scenery to come to life. Book sculptures are all about the fine details that go into the little pieces, especially when you’re recreating an entire street scene. 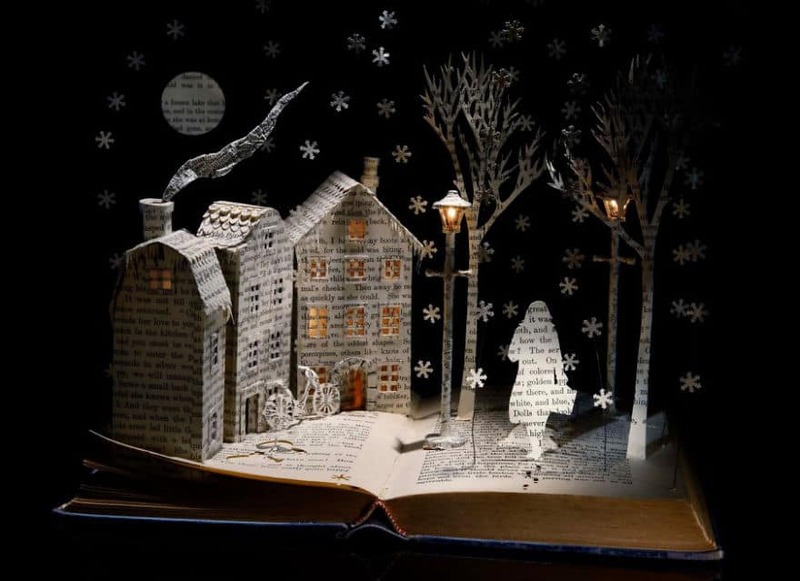 This artist managed to recreate the world outside of a multi-story home within the pages of the book they used, complete with the smoking chimney, a lit candle in the young girl’s hands, and the Christmas trees prominent within the windows of a few of the homes. A little background imagery does wonders, offering what appears to be either falling snow or stars above to set the scene. It’s a Christmas wonderland in as few words as possible, though it certainly took numerous pages to complete. The artist even managed to create a platform made entirely of the book’s pages to hold the setting up, which is rather impressive as it is, but there is even a little street curb at the edge. We’re curious to know how long it takes to create people from paper. If ever there was a sculpture to sing praise about, it may just be this one, which features an underwater scene, complete with mermaid and sunken ship. The artist of this particular piece managed to create a floating man, held aloft by seemingly nothing in mid-air, to give the sense of him floating down through the water from above. The well done mermaid leaps from the bottom of the ocean in an attempt to catch the fallen man, swimming past rocks and seaweed at the bottom of the ocean floor. But really, the lighting of the entire piece makes it or breaks it here, and the artist chose perfectly with the dark blue coloring to allow the sense that this took place deep in the ocean. 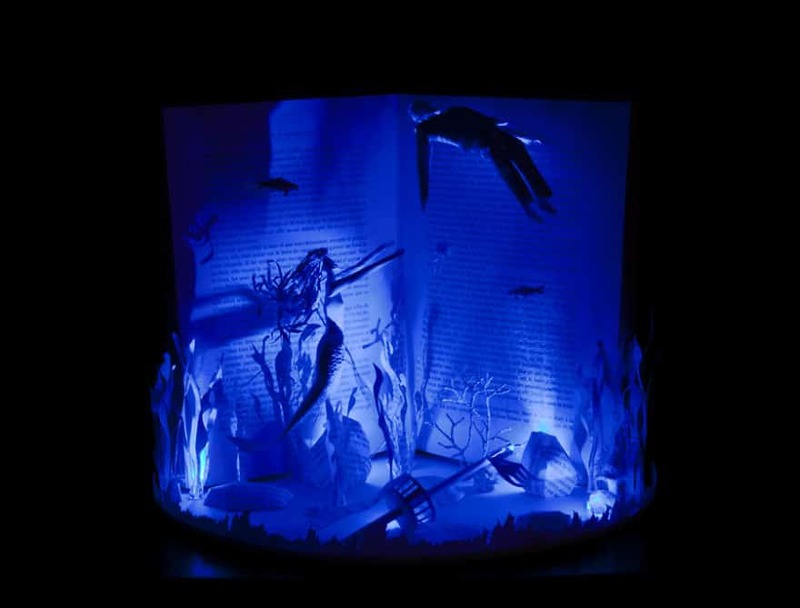 The reef is particularly interesting, as it manages to twist and poke out realistically, yet is made entirely of flexible paper from the book. The human body is a fascinating vessel, with muscles, ligaments, and bones creating the entire structure of our bodies to keep us up and moving swiftly through the world. Recreating such an intricately detailed specimen within the pages of a book appears to be nearly impossible, yet this artist managed to do so in spades, with different layers looking deeper into the human body as it moves further into the pages of the novel. The first will stand out for a long time, though, as it recreates and lists each body part buried deep within our heads and necks. This could be the best way to learn what is really inside your head for those who aren’t quite sure. Though some may find it a little creepy at first. We’re more interested than terrified at this point. Onlookers may be particularly fond of the markings delving into the side of the pages of the book, we certainly are. If you’ve ever been in a library, which we hope you have, you probably know they’re filled with books from all over. Books of all types, styles, lengths, and sizes, and they’re all magnificent and filled with imagination and information. It makes complete sense to recreate a library within a book using the technique of a master sculpture, just like this artist has done. A personal library is already an impressive achievement to have, but combine it with the open window, the dog sitting on top of the pile of paper books, and the girl reading against the makeshift chair, and you have an impressive piece, to say the least. Outside the miniature window, tiny bugs appear to float aimlessly through the paper air. It’s a beautiful sight, and one we cannot thank the creator enough for making come to life for the viewer. 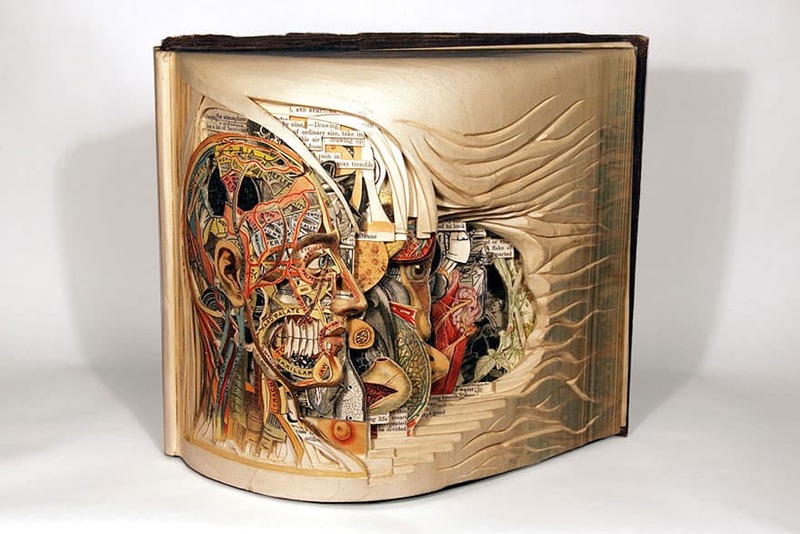 This piece should be an inspiration to all those out there even curious about making book sculptures.